For those searching for the Lethal Weapons Training Academy post, I’ve taken it private. I’m dealing with other things and I think it’s time to end it. The post still exists. I have not nuked it totally, but it’s not publicly accessable. You want to know the hardest thing for me? It’s hearing from all the other students that I was an obnoxious, abrasive, disruptive, jerk. They were all pretty uniform in their comments, so I have to accept that is the truth. I thank them for their honesty and I will see what I can do to mend my behavior. I can only apologize to them for disrupting their class. Let me repeat once again the update on the original post. Bob is a genuine combat Marine. He is not a fly by night, a PX Ranger, or a joke. Do not, in my hearing or on my blog, disparage his actual service. He paid a very high price for being out on the tip of the spear, a price that continues today. Like I said in comments, if you’re a praying person, spare a prayer for Bob. For my part, I pray that this weekend will not end up being thought the measure of the man. He has spent himself unsparingly for liberty probably as long as I’ve been alive both in the Marines and as a civilian. If I’m angry about this weekend, I’m still proud of him for how he spent his life. Comments are closed on this post. If you have something you need to say to me on this subject, my email is accessible on this site. UPDATE: People have asked if I have been threatened legally. The answer is no, absolutely not. Nor do I expect to be. Posted on June 3, 2013 by Sean D. Sorrentino | Enter your password to view comments. Tuesday was the third range trip with my new Belgian friends. You remember that a few weeks ago I took Marthe and Peter-Jan to the shooting range for their first time shooting a pistol. That went well and their second range trip showed improvement. They did well enough that I thought we should move up to a full size cartridge. Look at the grip and that stance. She’s driving the gun, not letting the gun drive her. During the first two range trips, Peter-Jan did better than Marthe. It was a curious reversal of the normal situation, where usually women listen better and learn faster. Well Marthe must have been sneaking off for extra practice because she improved dramatically when I put a Glock 17 in her hands. With any new semi-auto, I will only give a new shooter one bullet at a time. I don’t want a new shooter to get excited and crank off the second round into the ceiling tiles. We shot at 7 or 8 yards, at standard paper plates. Marthe put her first 5 rounds into her plate without even trying hard. It was pretty amazing. I made sure to pull that target and sign it. It’s not every day that someone puts their first 5 shots with a full power cartridge into the target. Peter-Jan struggled a bit, but quickly got the hang of it. 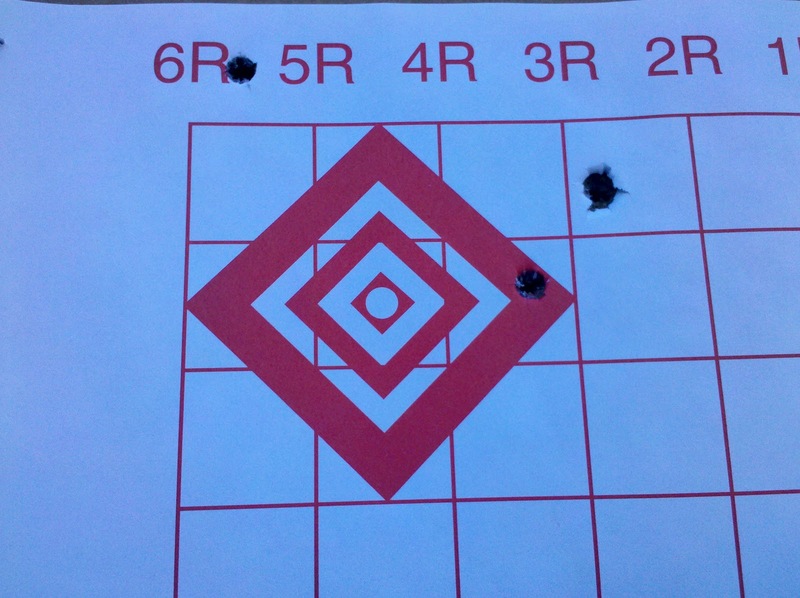 Once we swapped out targets, Peter-Jan put all the rest of his rounds (25) into his paper plate. He shot low a lot, but we know what’s causing that and we’ll be working on a correction. Unfortunately the photos of Peter-Jan were too blurry to post. Marthe was very accurate, but she struggled once we started loading multiple rounds in the pistol. She couldn’t get the gun to cycle correctly. She got stovepipes and failures to feed constantly. It wasn’t until the last 10 rounds she shot that I finally figured out what was going wrong. Her shooting hand wasn’t fully behind the gun. We moved her grip and suddenly the pistol ran great. We should be shooting again next week. A special thanks to Bob Reynolds of Templar Custom for the loan of his Glock 17. And have I said how much I like the people who run the Wake County Firearms Education and Training Center? They are polite, helpful, and quite a cheerful bunch. If you live close, you should check it out. What a fantastic day. I’m willing to bet that I had a better day than almost all of you. How? I got to take two new shooters to the range and teach them to shoot. Neither of them had ever shot a gun before. In fact, neither of them had ever even TOUCHED a gun before. How can that be? Because they are Belgians, and they are here in the US as foreign exchange students. In addition to being a great shooting student, she’s also very pretty. She’d seen guns in movies, but until today, she’d never actually put her hands on one. She proved that she could listen well and apply her training. She did awesome for her first day out. Peter asked me not to tell you his full name. He doesn’t want to show up in a Google search.He’s a lawyer from Belgium who’s here at Duke University’s law school for a year. Like Marthe, his only experience with guns is from Hollywood. He said that in Belgium, if you’re a criminal, you can get a gun in 10 minutes on the street. If you’re a law-abiding citizen, it’s very difficult. It’s considered “shocking” to have a gun in Belgium. How shocked would they be if they found out that Peter is actually quite a good shot? I met Marthe and Peter last week at the range safety class. Wake County requires you to attend a 3 hour class to learn the rules of the range. I knew right away that Peter wasn’t from around here, and as soon as I heard them speaking, I heard the accent. I asked, and they told me that they came to the class so that they could shoot guns. They were in America, and the one quintessential American experience is shooting a gun. They didn’t know that the Wake range doesn’t rent guns, so I offered to meet them tonight and let them try out my Ruger 22/45. It’s the perfect gun for beginners. It doesn’t beat you up and it’s accurate and easy to handle. They both were happy with it. We spent the better part of two hours shooting 50 rounds each. The range safety officer was really supportive. Having a female RSO worked to our advantage. Peter, after looking around the range, remarked that shooting seemed to be a family sport. There were women and children on the range. There was a really nice African-American woman in the lane next to us when we started. She really had that famous Southern charm. She though it was fabulous that these Belgians were here learning how to shoot. The Wake County range sure put its best foot forward today. After shooting, we talked outside. Peter and Marthe both told me that they found that the biggest thing they learned was that shooting is about concentration and focus and not about excitement. It was fun for them, but it was a sport that required discipline. Peter pointed out my favorite thing about shooting. It has instant feedback. You know right away if you did it right or wrong. You don’t get to make excuses. You do it right and you are rewarded with success. You do it wrong and you see the results. The instant feedback forces you to focus and do it better each time. We’ve made plans to meet up again on some future Tuesdays and shoot some more. They are even interested in taking a full day shooting class with a professional shooting school. They even gave me Belgian beer and baked goods! Like I said, I had a fantastic day. During my birthday range trip today, James let me fire his Ruger Super Redhawk Alaskan in .454 Casull. I’m not a recoil junkie by any means, but how could I pass it up? This is my target at 25 yards. I think I did pretty well for a guy who never shoots a revolver, and never shoots double action. 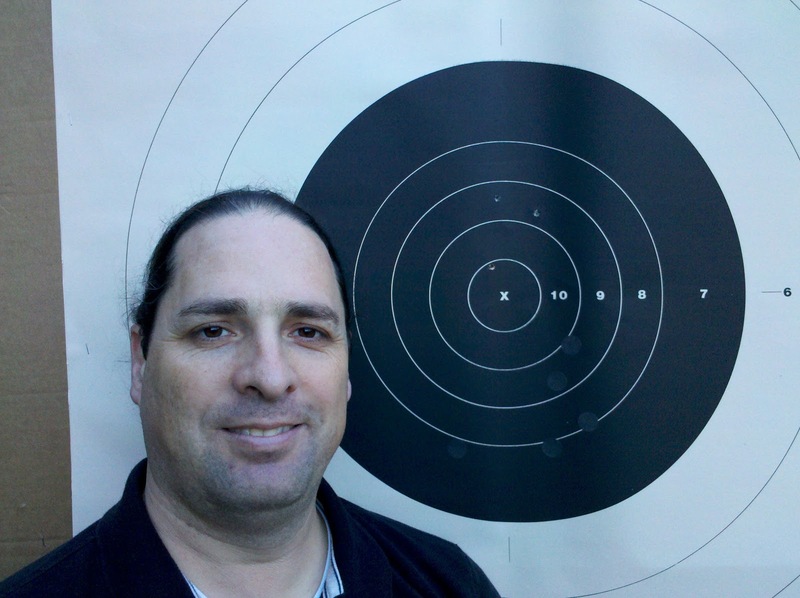 James says that typically people don’t shoot high, they usually dig a trench under the target. I’m not sure I am up to rapid firing this thing. Today is my birthday. Not my 27th birthday. It’s the 27th birthday of my rifle. Well, maybe it’s better to say it’s my rifle and my 27th anniversary. In any case, I received this rifle on my 15th birthday, 27 years ago. It’s a Remington Model 700 in .243 Winchester. And is still shoots pretty well. 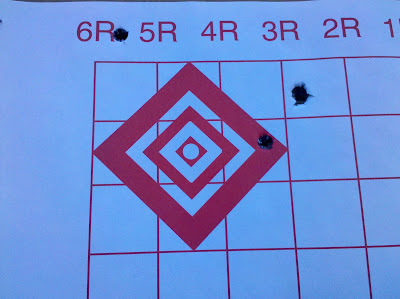 This is my “well, that’s as good as I am likely to get” zero at 200 yards. The bullets are 75gr V-Max rounds that I hand loaded on top of an undisclosed amount of IMR4064. They should be hustling along at about 3,200 feet per second. And this is what I managed to pull off at the 300 yard line. The last three were Kentucky windaged into position. I’d like to thank reader James for taking me to the range today. 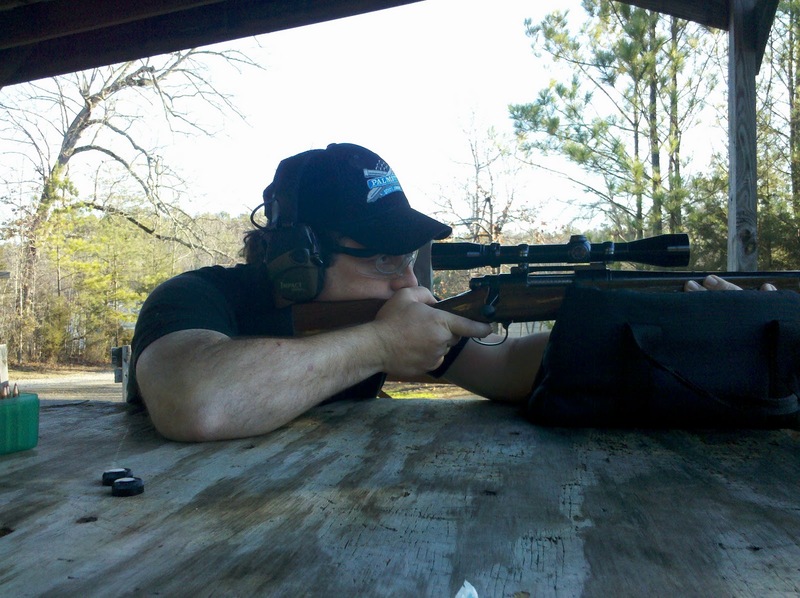 The range is Durham Rifle and Pistol Club. James is a member and offered to take me there in order to sight my rifle in properly. The club itself is very nice. They have multiple firing areas for different distances. As you can see above, I was able to shoot all the way out to 300 yards. You can’t do that every day. If you live in the area, you should check them out. Fees are pretty reasonable, $144 a year. They have some initiation fees. Overall, not bad at all for what you get. They even supply your targets!